A major new installation by internationally acclaimed British artist, Mat Collishaw has been unveiled at The Queen’s House, Greenwich. The specially commissioned work, The Mask of Youth, responds directly to one of the most important paintings in the Museum’s collection, the iconic and powerful Armada Portrait of Elizabeth I. Positioned directly opposite the Armada Portrait and suspended in isolation on surveillance mirror, the installation places both the ageing and ageless Elizabeth in dialogue. Through this careful juxtaposition, Collishaw’s work explores the different sides of the queen, both real and imagined, and grapples with notions of mortality, the manipulation of truth, political propaganda and the extent to which female power is tied to appearance and youth. Using digital scans of Elizabeth’s portraits and the electrotype cast of her effigy, as well as descriptions by her contemporaries, the artist has devised a chillingly lifelike recreation of Elizabeth I. Known for his fusion of technology and art, Collishaw brings Elizabeth back to life before her audience. By leaving the animatronics that facilitates her movements deliberately exposed at the back of her head, the artist suggests that behind Elizabeth’s public persona, her every movement was carefully controlled. Beneath the surface and behind her mask, she is busy making decisions and calculations to which no one else is privy. Inspired by historical art throughout his career, Collishaw has long been fascinated by the Armada Portrait and its function as a political statement that emphasises the sovereignty and ‘agelessness’ of a queen who in reality was middle-aged, unmarried and heirless. While Elizabeth’s portraits were designed to flatter; they also highlight her understanding of the fact that her public image could be used to suggest her power and authority. As a woman of intelligence, she used this tool to help overcome the cultural prejudices she faced due to her gender and to advertise her virtues, skills and competence as a female head of state. Evidence suggests that Elizabeth did not sit for lengthy portrait sessions. Instead, her face was the only part of her that was drawn from life. These drawings were used to form an approved pattern that was used as the basis for any reproduction of her image. Collishaw’s mask indicates the ways in which these images might be manipulated for political purposes in order to efface the vulnerabilities and perceived weaknesses that Elizabeth took pains to hide. The images produced during the latter part of Elizabeth’s life have come to be known as ‘The Mask of Youth’ because of the careful way in which they emphasise the Queen’s beauty and strength over her ageing face and body. By using the name of the portrait type as his title, Collishaw suggests that Elizabeth’s life was spent behind a mask both figuratively and metaphorically. In today’s world of social media and obsession with manipulating photographs to present their subjects in the best light, Collishaw’s mask raises questions about both the historical and modern preoccupation with female appearance. Elizabeth was a pioneer of many of the practices of image manipulation that technology facilitates. Collishaw invites audiences to consider the loneliness and isolation that may lie underneath the presentation of a carefully-curated public image. Mat Collishaw’s Mask of Youth is on display at the Queen’s House from 3 October 2018 – 3 February 2019. The presentation of Collishaw’s works is part of a National Lottery funded the three-year programme of events and exhibitions related to the Armada portrait and Elizabeth I that will be taking place until spring 2020. 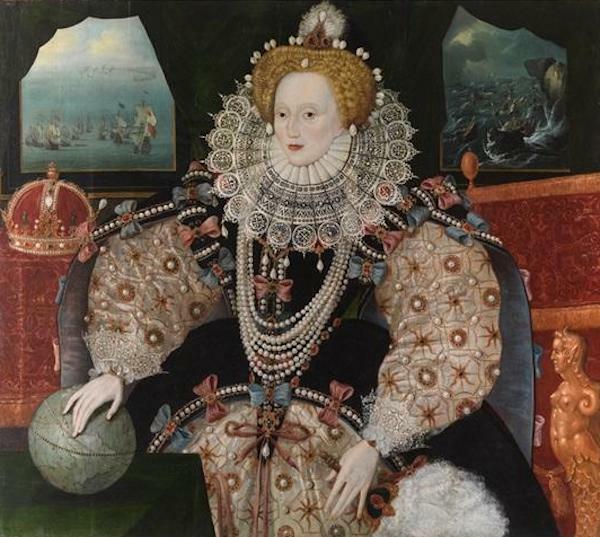 The National Lottery grant of £7.4m from the Heritage Lottery Fund (HLF) also helped purchase the Armada portrait and enabled it to be permanently housed at the Queen’s House. The programme includes a newly commissioned display of photographic portrait miniatures by Bettina von Zwehl, in the King’s Privy Chamber of the Queen’s House.